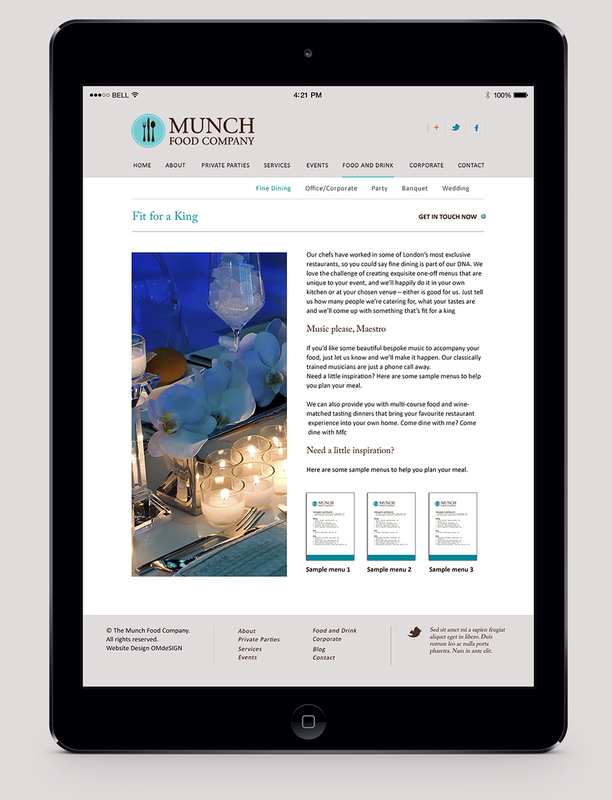 Munch Food Company is a young, dynamic catering company based in London owned and run by Michelin-star trained chef, Keith Goddard. The company caters for all kinds of events from society weddings to corporate lunches to 21st birthday parties and has an impressive client list that includes show business luminaries and politicians. The client wanted a website that would make the mouth water! The food at Munch is as famous for its exquisite presentation as it is for its flavour and we needed to showcase the food first and foremost. The client wanted every visitor to the site to immediately feel that they had found the right catering company for their event. We created a site that was simple, elegant, and worthy of a Michelin star! Imagery was given prominence so that visitors could get a real sense of the variety of food available, while lively copy complemented the design. We also included downloadable sample menus for clients who needed a bit of inspiration for their event or party. We created a blog so that the team could update visitors on news and events and also provide useful information for any foodies who happened across the site!